What Can I Learn in an Online Master’s in Special Education Program? What Can I do with a Master’s in Special Education Degree? How Much Can I Make with a Career in Special Education? Special education teachers are in high demand, as student enrollment in programs that provide special education teaching has increased during the past few years. Part of the reason for this is that disabilities in children are being identified and addressed more quickly than ever before. A convenient way for you to increase your skill level and make yourself more competitive in this field is to earn an online master’s degree in special education. Find out what you’ll learn in this degree program and search the best online master’s degree in special education programs to find the one that works for you. Check out our rankings list below to see which one of the top-rated special education master’s degree programs would be the greatest fit for you. For these rankings, we obtained our data from the United States Department of Education, the Integrated Postsecondary Education Data System and the universities’ own published materials. All of the schools in our list are accredited. Depending on your professional experience, students at the Christian-based Mount Vernon Nazarene University can enroll in 2 pathways to earn a Master of Arts in Education with an emphasis in special education. Both programs, which are accredited by the National Association of Colleges for Teacher Education and Ohio Department of Education, are intended for individuals who plan to work in Ohio. The first option is available to prospective teachers working to receive an initial teaching license as an intervention specialist for mild or moderate disabilities. Students will satisfy 53 semester hours, which include 9 credits of student teaching. Curriculum covers foundational education courses, such as Technology for Educators and Classroom Management and Behavior Analysis, as well as concentration-specific courses exploring professional practices in intervention services and progress monitoring. Students finish coursework in an average of 34 months. An alternative opportunity exists for teachers who are currently licensed in Ohio. The advanced licensure program, which takes around 22 months to complete, requires 30 semester hours and entails 2 credits of practicum experience. In order to be eligible for both options, you must have maintained a minimum 3.0 GPA in undergraduate coursework, pass an interview and mail in transcripts. A copy of your Ohio teaching license must also be submitted for the advanced pathway. Students can utilize a number of resources to assist in their studies. The Center for Student Success provides free tutoring, an academic peer mentor program and writing center services. The Career Development Center assists in networking, job exploration, resume writing and interview preparation. Liberty University is a Christian-based learning institution aiming to balance academics with spirituality. The School of Education, which is accredited by the National Council for Accreditation of Teacher Education and Council for the Accreditation of Educator Preparation, offers a 100% online format to earn a Master of Arts in Teaching Special Education. For added convenience, 8-week classes begin at 8 different times each year. Although there are deadlines for assignments and exams, students decide where and when to access their coursework via the web platform Blackboard Learn. Graduation and initial licensure entails the fulfillment of 36 credit hours, which must be passed with a letter grade of B or above. However, students may receive a C in 2 of their classes. Core curriculum classes include Tests and Measurements, Learning Theory, and Historical and Philosophical Foundations of Education. Concentration-specific courses include Collaborating for Successful Inclusive Classrooms, Educational Assessment and Intervention, and Principles of Behavior Management. Online learners will also participate in a student teaching internship within their location of residency, which requires a background check. The Office of Online Student Life is committed to creating a supportive online community by linking students to helpful videos, campus blogs, counseling services and a spot to submit prayer requests. You will also have access to academic advising, a writing center and technical assistance. In-state and out-of-state enrollees pay the same tuition rates. Veterans pay $140 less per credit hour, and emergency responders are given a 25% discount. In order to be eligible for the program, you must have maintained a 3.0 GPA in undergraduate work. Students enrolled in an online program to earn a Master of Arts in Special Education at Concordia University, St. Paul choose from 3 areas of licensure. The first option, which focuses on specific learning disabilities, requires 33 credit hours, and classes include Teaching Students With Math or Language Difficulties and Collaborative Consultation in Special Education. A second concentration prepares graduates to work with students who have autism spectrum disorders. There are 39 credit hours needed to finish this program, and classes cover Communication and Social Skills Training as well as Interventions: Autism Spectrum Disorders. As a third choice, students can work toward 36 credit hours to specialize in emotional and behavioral disorders. Classes from this curriculum include Behavior Management and Adolescents With Emotional or Behavioral Disorders. All degree options entail an applied field experience as well as a capstone research project. Students will participate in their programs as a cohort, thereby following a structured plan of study with the same group of peers. Courses last for 7 weeks, and students will work through 1 class at a time. Although classes are mostly self-paced, online learners are expected to engage in a real-time web discussion once every week. Tutorial videos are available upon request to acquaint students with online studies. Students also have access to on-campus resources, such as writing center services, free tutoring through Brainfuse, career guidance and academic advising. Admission requirements include a minimum 3.0 GPA in undergraduate coursework, transcripts, the submission of a FAFSA and an essay showcasing your professional experience and future goals. Fontbonne University is a private, Catholic-based higher learning institution providing students with the opportunity to earn a Master of Arts in Education with a concentration in special education. This degree can be completed through a combination of evening and online classes. The program entails 32 total credit hours with classes such as The Teacher as Leader, Contemporary Issues in Education and Research Methods in Education. All students must take the 2-credit course Action Research, in which they utilize their classroom experiences to compile data and execute an idea or solution. The special education concentration explores the topic through classes like Enhancing Student Achievement Through Positive Behavioral Supports, Differentiated Instruction, Assessment of Ability and Achievement and Counseling Techniques. Courses are delivered in a 16-week format, and online studies are implemented via the learning platform Schoology. Technical assistance is available to help navigate this system. Online students also have access to the Kinkel Center for Academic Resources, which provides free tutoring services for business, math, science and writing subjects. Additional supports include the library, career center and proctoring services. In-state and out-of-state enrollees pay the same tuition rates for on-campus and distance education credits. The school also offers a 15% discount to educators who work a minimum of part-time hours at any pre-K-12 educational establishment. If eligible, students can connect with an admissions representative in order to fill out a registration form, which must be turned in every semester. In order to be admitted to the program, students will submit the graduate school application, transcripts indicating a minimum 3.0 GPA, 3 professional references and a 300-500 word personal statement. Nyack College was founded in the late 1800s with the mission to instill a sense of diversity and community vibrancy through, what the founder A. B. Simpson, a pastor, described as taking "the Good News of God's love" to everyone. From there, Nyack has grown into an institution of over 2,500 students with a robust online education program that takes this founding vision to heart. This is especially true within the Master of Science in Childhood Special Education program that is designed to prepare educators to work with exceptional children in first through 6th grade. The program has 3 tracks depending on a student's experience and certification: initial certification, additional certification and non-certification. The initial certification is only for New York State residents. The 42-credit curriculum is designed for students wishing to become special education teachers without prior experience. There are significant prerequisites for the program, such as a sufficient liberal arts/sciences background (including 30 credits with a C grade or better in a liberal arts or sciences subject), 6 language course credits other than English, an intro psychology course and evidence of computer literacy. The additional certification is a 30-36-credit program for students already possessing a New York State teaching license but who want to specialize in special education. While there are similar prerequisites to the initial certification track, they aren't as rigorous. The non-certification is a 30-credit program ideal for students who don't need certification or who may teach within an independent school setting. The foundational courses for all the programs are the same, including Inclusive Classroom, Exceptional Child, Field for Autism and Literacy. Each certification track, however, includes additional coursework necessary for certification. New England College is an established liberal arts college that is committed to instilling values of imagination, respect, caring, appreciation of truth, inquiry, ethics, ecological sustainability and lifelong learning into its curriculum. As a small institution, there is a large commitment to online learning with 900 graduate students completing their degrees online. Students interested in special education can find an excellent program in New England College's Master of Education, Special Education. The Master of Education program is designed for currently certified teachers or prospective students who wish to become certified in a specific concentration, including special education. The curriculum is built to satisfy the New Hampshire State Certification Standards and the Interstate New Teacher Assessment and Support Consortium (INTASC) Standards. Because of this design, graduates will be prepared to complete certification in the concentration. To graduate from the program, students must complete 37 credit hours. All Master of Education students, no matter the concentration, are required to take the program's core courses (a total of 28 credit hours). Examples of those courses include the Psychology of Learning Communities, Dynamics of Education Reform and Systems Change, Research Practicum and Fundamentals of Educational Inquiry. Of the 9 electives, students will choose courses that are consistent with their special education concentration. All students will complete a final portfolio as well. Because students from all concentrations are required to complete the same core courses, students of special education are exposed to a wide array of backgrounds and interests. Saint Leo University has established itself as a leader in online education through its Saint Leo WorldWide programming. The Master of Education - Exceptional Student Education program is an excellent program for prospective students interested in a special education degree with the flexibility and strong online education track record of Saint Leo. The program is designed for general educators who are interested in expanding their areas of certification. Students in the program come from a diverse set of K-12 environments. All of the courses are offered completely online, but there is a fieldwork requirement, which can be completed in the students' own school settings. The program offers 3 tracks for students. Track A is a program that requires 36-39 credit hours of coursework for any student interested in achieving certification eligibility in the State of Florida in Exceptional Student Education (K12). Track B, requiring the completion of 36 credit hours, is for students who already hold a teaching certificate in Florida but wish to gain eligibility for Florida's Exceptional Student Education certification. Track C, also 36 credit hours, isn't a state-approved program, but it's ideal for current teachers who want to expand their knowledge in special education without the goal of certification. While some of the coursework is dependent on the specific track, example courses include Literacy Assessment and Intervention, an Introduction to Law, Ethics, Placement and Diversity in Special Education, Theories and Methods for Mild to Moderate Populations and Collaborating in Inclusive Settings. The program stands out with a faculty who are current practitioners in school administration and well recognized in the field. The University of Oklahoma-Norman Campus has a unique "One University Digital Initiative" with a goal to create innovative educational strategies while also helping students save money through free online textbooks. This commitment to expanding the digital availability of learning materials also extends to the university's online degree programs. For students who need that extra flexibility to complete a degree, OU's Master of Education in Special Education program can be completed either completely online or in a hybrid model, which combines some face-to-face courses on the Norman, Oklahoma, campus and some online coursework. There are 3 concentration options available for master's degree-seeking students: general degree for non-certification, secondary transition and applied behavior analysis. The general degree has the most flexibility and is ideal for current educators (special or general education), family members of students with disabilities, or caregivers or community agency staff who are interested in delving into current theory and practices of special education. The general concentration doesn't lead to certification. The secondary transition education concentration prepares transition coordinators and is a degree typically pursued by students with prior certification in special education or experience in a related field. The applied behavior analysis (ABA) concentration is geared toward students who are interested in learning about the behavior analysis intervention practice that is widely accepted as one of the most effective methods to improve skills of children in special education programs. The Behavior Analyst Certification Board has approved the courses and sequence within UO's program. All of the programs require the completion of 33 credit hours, a number of which are special education core courses such as Applied Behavior Analysis in School, Advanced Assessment, and Contemporary Issues and Research. Both the ABA concentration and the secondary transition program require additional concentration-specific courses to complete. The University of the Cumberlands was founded over a century ago with the mission of preparing servant leaders. This servant leadership model extends over to the university's education program, which was established in 1888 with the understanding that teachers have the opportunity to help young people thrive. Now with completely online offerings, students may earn a teaching degree in a completely flexible format. The University of the Cumberlands offers the online Master of Arts in Teaching program where students can specialize in a variety of education areas, including special education-learning and behavior disorders. This program with a concentration in special education is designed for students who already possess teaching certificates to advance their practice and achieve special education certification. Students complete 42 credit hours of coursework in courses such as Teaching Math to Learners With Disabilities, Classroom and Behavior Management, Special Education Evaluation, Working With Parents and Trends in Special Education. Students will also be required to complete 3 clinical experiences including a professional experience. The MAT program sees critical thinking and reflection as pivotal to teacher education, and it is infused in all of the degrees' programming. The average completion time for students is 18 months; however, this often depends on the pace in which the student moves through the coursework. In addition, the University of the Cumberlands has a unique program for veterans wishing to pursue a teaching degree called "Troop to Teachers". Provided there are available funds, eligible students may receive stipends of up to $5,000 to help pay for teacher certification costs or $10,000 in the form of bonuses to teach in schools that serve a high percentage of low-income students. The University of Alabama's online education program, Bama By Distance, offers a wide range of distance and hybrid-learning opportunities for students. Prospective students with a bachelor's-level teaching certificate and an interest in pursuing special education have 2 program options through the Master of Arts in Special Education program: collaborative 6-12 certification and gifted and talented certification. Both of these programs are "blended," or hybrid, programs that combine online coursework with in-person weekend and web-assisted courses on the Tuscaloosa, Alabama, campus. This hybrid model allows full-time educators to pursue the degree toward certification. The special education collaborative program leads students to Alabama Class A certification in Grades 6-12, and the coursework is designed to prepare special education teachers of secondary school students with the skills needed to teach students with exceptionalities. Students complete 36 credit hours of coursework in courses such as Diagnosis and Assessment of Exceptional Children and Youth, Creative Problem Solving, Intro to Mild Disabilities and a practicum in secondary student special education. Students in the Gifted and Talented Certification track are prepared to understand the special nature of gifted and talented students in order to adapt and structure educational strategies appropriately. To graduate, students will complete 30 credit hours in coursework such as Psychology of Gifted and Talented Children and Youth, Creative Problem Solving, Teaching Thinking Skills, and Diagnosis and Assessment of Exceptional Children and youth. Students will also complete summer enrichment workshop internships in addition to the regular internship. Additional special education electives are available students. Teachers certified to teach in Texas can enroll in Midwestern State University's online and hybrid master's degree in special education program. The program is designed to prepare students to work as educational diagnosticians and work within their institutions and communities to create or improve on existing services for children with disabilities. Students can choose to concentrate in the area of dyslexia, developing their skills in working with children and adults who have dyslexia or a related learning disability. Graduate coordinators can help individual online students direct their course of study in this program. All students learn in an online classroom format as well as through extensive clinical teaching hours. Graduates from MSU's degree program must apply for professional certification in order to complete their degree. Similarly, graduates from the dyslexia concentration must complete an exam from the Academic Language Therapists Association to become Licensed Dyslexia Therapists as part of their degree completion. 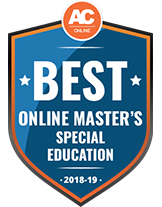 The online MSU master's in special education program is accredited by the Commission on Colleges of the Southern Association of Colleges and Schools, and the Division of Educator Certification Standards of the Texas Education Agency. Online students enrolled in the program can apply federal and state financial aid towards their tuition, and they can apply for department-specific scholarships as master's in education students. MSU'sCareer Management Center can help online students access career resources, from job postings to informational guides on job application tips. There are also library and technical service resources available to MSU distance learning students. Chaminade University of Honolulu offers an online master's degree in special education to currently certified teachers and to students who have earned their bachelor's degree. Courses are delivered in an accelerated 10-week format and the program can be completed in 21 months. The program is accredited by the Council for the Accreditation of Educator Preparation and incorporates research, educational theory and practical work in the field. Students choose to focus their course of study on special education in classrooms from kindergarten to grade 6 or special education in classrooms from grades 6-12. These concentrations include a student teaching placement in a classroom, after the student successfully passes the PRAXIS II in special education. A third concentration is in special education in classrooms from kindergarten to grade 12, which requires students to take 2 student teaching placements at each level of instruction: K-6 and 6-12. Graduates from the Master of Arts in special education program are prepared for Hawaii's state teaching licensure. They can work in classrooms teaching children with mild to moderate disabilities at educational levels from K-12 based on their concentration area. Online students can receive federal or state aid and can apply for endowed scholarships to help pay for their degree at Chaminade. The college offers a discounted tuition rate for members of the military who are earning their degree online, and accepts military tuition assistance and military credits. Chaminade is also a GI Bill-approved college. Online master's program students can access tutoring services and career development services. Individuals with bachelor's degrees who are interested in pursuing a teaching certificate in special education can enroll in a master's degree program at Clemson University to develop their special education knowledge. This on-campus degree program is accredited by the Council for Exceptional Children, and students are assessed based on the professional and ethical standards set out by this accrediting body. The program emphasizes assessment and individual education plan development, as well as advocacy practices that students in the program can employ to improve academic and social outcomes for the students with disabilities that they may work with in their chosen careers. Graduates of the program meet the requirements for earning an initial teaching licensure in special education and learning disabilities in elementary and secondary schools, and they can go on to earn licensure to teach within South Carolina. Residents can apply for loans to pay for their master's in special education, including the South Carolina Teacher Loan and the Career Changers Loan. All students in this program are also eligible for the federal TEACH Grant as well. The college does not offer institutional financial aid to students. Veterans may be able to use their benefits to help pay for their online master's in special education degree through this institution. Residents of South Carolina who are also children of certain war veterans may be eligible for free tuition and education assistance. Online students have access to career resources through Clemson, which includes a job board, internship program information, advice on practical job skills, and career development resources for graduate students. Students enrolled in the Master of Science in Special Education program at Minot State University can earn this degree in a fully online format. Applicants must have completed a bachelor's degree in special education, education or a related field in order to be considered for the program. MSU is accredited by the Higher Learning Commission, and the master's in special education program is accredited by the North Dakota Education Standards and Practices Board. Students can complete their degree while working full time, and the program is designed to prepare students for leadership roles in their communities and schools so they can improve special education opportunities for their own students. Students choose to focus their studies in 1 of 4 concentrations: Deaf or Hard of Hearing, Specific Learning Disabilities, Early Childhood Special Education or Special Education Strategist. The Deaf/Hard of Hearing Education emphasis area requires students to complete prerequisites in sign language and audiology, but previous experience can apply towards these requirements. Graduates from the program must complete a Special Education Praxis 2 exam in their chosen concentration subject, in addition to concentration-specific degree completion requirements. Residents of North Dakota and students who intend to teach in the state will graduate from MSU's program with the knowledge and experience to prepare them for teaching licensure in North Dakota. Online students are eligible for financial aid through MSU, including federal and state aid, grants and scholarships. There are also department-specific scholarships available to students enrolled in the Master of Science in Special Education program. Current teachers can enroll at Bemidji State University to earn a Master of Special Education degree. The college designs this program of study around theory and research, and students develop their knowledge and skills further through field experiences that are connected with each course. The college is accredited through the Higher Learning Commission, and most of this degree program's credits are based on the Minnesota Special Education and the Council of Exceptional Children's licensure standards. Students in BSU's special education master's degree program can choose to obtain additional licensure in Autism Spectrum Disorder, Emotional Behavioral Disorder, and/or Specific Learning Disabilities. Each licensure requires the student to take 3 courses and complete a project applying their knowledge in the chosen area of special education. Graduates from the online master's program can obtain licensure to teach in special education classrooms. BSU offers all graduate students the tuition rate for residents of Minnesota. Students can apply federal and state aid towards their tuition as well, and online students can apply for a specific, distance-learning scholarship through the college that provides funds for students in teacher education degree programs. Online students have access to student resources such as tutoring, writing assistance, technical support and career services. American Indian students from Minnesota who enroll at the college can find community engagement opportunities, networking and scholarship information through BSU's American Indian Resource Center. The college also offers resources and assistance for veterans enrolled in degree programs, including information about GI Bill eligibility, scholarships, tutoring, financial aid and disability services. Texas A & M University offers an online master's degree in special education that can be completed in 2 years. The program is accredited through the Southern Association of Colleges and Schools Commission on Colleges, the State Board of Educator Certification and the Texas Education Agency. Students do not need a teaching certificate to enroll, but Texas A & M's online master's program is designed for individuals who have experience in education, disability or related fields. Applicants who have instructional or clinical experience working with individuals with disabilities are highly desirable. Students in the program are encouraged to commit to work in the field or pursue additional graduate training after they receive their master's degree through this program. Graduates from the program are prepared to enter careers as administrators, general or special educators, behavior coaches, counselors or therapists. Online students are able to apply federal, state and private financial aid towards the cost of earning their degree, and they can apply for grants and scholarships through the college as well. Online special education degree graduate students at Texas A & M can apply for the Heather Bradley Scholarship, which is department-specific financial aid. Distance learning students who earn a competitive institutional scholarship or fellowship of $1,000 or more are allowed to pay in-state tuition rates for the academic year in which they receive the award. Texas A & M has a Student Council for Exceptional Children, which is a branch of the international Council for Exceptional Children that supports professionals working with and advocating for individuals with disabilities. Online students can choose to connect with peers and explore professional development opportunities through this organization. Northern Michigan University delivers an entirely online master's degree program to current educators or professionals in education institutions. The degree has concentrations available in learning disabilities and early childhood education that address special education topics. This program of study is accredited by the Council for the Accreditation of Educator Preparation. Certified teachers working to earn a Master of Arts in Education degree through NMU can also pursue endorsements in learning disabilities or early childhood education, which can later turn into a master's degree that concentrates in these areas. Applicants must have 1 year of experience in teaching to apply for the program, and a bachelor's degree is preferred. All students enrolled in the master's degree program are assigned an academic adviser to help plan individualized courses of study and evaluate a student's experience to see if it can apply as credit toward their master's degree. The online master's with a concentration in early childhood education prepares graduates to teach children ages 3 to 6 in special education classrooms, while the concentration in learning disabilities prepares graduates to work in a range of settings with students who have different kinds of learning disabilities. For students who need financial assistance for their degree, NMU accepts student financial aid funds from federal and state financial aid, including the TEACH Grant. The college also accepts American Indian Tribal Grants and a ROTC Scholarship is available to online students. Veterans can apply their benefits towards a degree, and NMU is a DANTES partner for online education. Indiana University offers an entirely online master's program in special education to certified elementary and secondary school educators. The program is accredited by the Council for the Accreditation of Educator Preparation. Students earning this online master's degree can choose to add certifications for mild interventions or intense interventions to their program of study. As part of the program requirements, they focus their studies on autism, behavior specialists, early childhood, instructional strategies or intense interventions. Online students will develop their skills through field-based experiences as well as distance-learning settings, and receive individualized instruction from mentors during their field work placement. Currently employed teachers in the program can use their own classrooms and identify a coworker or local mentor to work with them. Graduates from IU's online master's degree program are prepared to apply mild, moderate or intense disability interventions in preschool, elementary and secondary school settings. Online and international students can explore tuition assistance or reimbursement programs through current employers. As students in IU's School of Education, online students in the master's degree in special education program can apply for department-specific scholarships to help pay for their education. They are also eligible for fellowships and assistantships through the School of Education, and the college provides resources on outside funding for graduate students pursuing a degree at this college. IU offers a range of financial aid for students, including federal and state financial aid, and students can apply for scholarships and grants. Veterans can access support services and financial aid that is given specifically to members of the military to pay for their education. Current educators as well as graduate students from fields outside of education can enroll in Northern Arizona University's online master's in special education degree program. This program explores instruction strategies for students with learning disabilities, physical or intellectual disabilities, and emotional or behavioral disorders. The degree program is accredited by the National Council for Accreditation of Teacher Education and offers concentrations in early childhood special education, disability studies and cross-categorical high incidence special education. Students can also choose to earn certificates in these 3 areas instead of concentrating their master's degree, and the programs of study prepare them for teaching certification. The college offers 3 other special education certificate areas in assistive technology, autism spectrum disorders and positive behavior support, but these certificate programs don't prepare students to apply for teaching certification. NAU's online master's degree program can be completed in 2 years in an accelerated format. Graduates are prepared to start or advance their current teaching careers in preschools, elementary and secondary school settings, and private and public businesses. They can pursue careers as special education teachers, case managers, consultants or directors of special education. Online students at NAU have access to technical support, tutoring and library resources through the college's Academic Success Center. Tuition discounts are available for veterans and current military personnel, and online students may also be eligible for tuition discounts depending on their state of residence. NAU also allows online students to apply for federal, state or private financial aid to fund their master's degree. 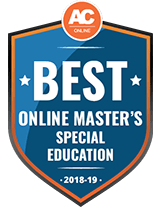 Northwest Missouri State University's online master's in special education program prepares currently certified educators to work with children who experience a range of disabilities and to advocate for students who have specialized education needs. This Master of Science degree program is accredited by the National Council for Accreditation of Teacher Education. Instruction is offered in an accelerated, 7-week course format that can be completed in 12 months. Some courses require students to gain field experience, which allows them to practice their skills in a professional setting. NMSU's Master of Science in Education in Special Education degree prepares graduates to teach children with mild and moderate disabilities in a range of educational institution settings, from preschool to secondary school. The master's degree program prepares students for certification in special education, and addresses methods of gathering data to make instructional and planning decisions. Graduates are equipped to pursue careers as special education teachers, resource program teachers or intervention specialists. Distance learning students pay the same tuition rates as Missouri residents and are eligible to apply for federal financial aid to assist them with paying for their master's degree through this institution. Student resources at NMSU include access to department advisers, the college's library resources and technical support, which is available 24 hours a day and 365 days a year for online students needing help. Students who are in the military or who are veterans can receive educational and financial assistance from the U.S. Department of Veterans Affairs, such as the Veterans Educational Assistance Program. The University of South Florida offers currently certified teachers or students able to gain field experience in elementary and secondary school education the opportunity to earn a Master of Arts degree in special education through a fully online program. Through the accelerated format of the program and the flexible schedule, students can work full time as they earn their degree. The program is designed to be completed in 4 semesters and a summer, and is accredited by the Council for the Accreditation of Educator Preparation. Students can choose to pursue specializations in behavior disorders, learning disabilities, intellectual disabilities and exceptional student education. The coursework for these specializations my lead to an endorsement in autism, severe and profound disability, gifted education or reading. Graduates of USF's online master's in special education degree program are certified in Exceptional Student Education in the state of Florida. Students earning this degree through a hybrid format can be placed in a paid teaching assistant position in a local school district. They are also assigned mentors for each participant within their local district. USF is part of the national Student Council for Exceptional Children, which encourages student advocacy and service towards children with disabilities. Joining this organization is voluntary, and can be a way to connect with peers and like-minded professionals. Students in the online master's program can receive federal, state or USF financial aid, including loans and scholarships; apply for TEACH Grant funding; and can apply for the Laurie Ann Richardson Scholarship. This scholarship is merit-based and given to students in USF's Masters Degree in Exceptional Student Education at the Tampa College of Education. International students can also enroll in USF's online special education program. The Master of Arts in Special Education at Ball State University is offered fully online and is designed to allow currently licensed teachers to add special education to their licenses. It doesn't provide initial licensure to aspiring teachers. This 30-credit program offers students the option to choose from 9 focus areas. These include 5 departmental graduate certificates (applied behavioral analysis, autism, disabilities for postsecondary settings with emphasis in autism, emotional and behavioral disorders or response to intervention) and 4 add-on teacher licensure options (an administrative license for director of exceptional needs or teaching licenses in early childhood special education, mild interventions and severe interventions). Depending on the specialization, students may be required to participate in some on-site courses. All students must complete a research course. Applicants need not possess GRE scores. The admission requirements call for bachelor's degrees with cumulative GPAs of at least 2.75 or cumulative GPAs of at least 3.0 in the second half of the baccalaureate program. The program doesn't require letters of recommendation or separate materials as part of the application process. Tuition per credit hour doesn't vary by whether the courses are taken online or on campus. Online students at Ball State receive a number of support services, including academic advisement, free online tutoring, access to the Ball State writing center, peer mentorship, tech support and career-planning assistance. Online students also receive access to an online orientation that helps familiarize them with the experience of studying online. The Master of Science in Special Education at Missouri State is a hybrid program that combines online and classroom delivery for courses. The program offers students the opportunity to specialize their degrees by choosing 1 of the 4 areas of concentration: autism spectrum disorders, orientation and mobility, blindness and low vision and special education alternative certification track (SEACT). The program was created to fast-track the professional preparation of special education teachers by allowing students to earn both their teacher certification in cross-categorical special education and master's degree in one program. The SEACT track adds the special education alternative certification to enable graduates to teach students with mild to moderate disabilities. Depending on the specialization chosen, the program is comprised of 36-45 credits, and it includes supervised practicums and on-site, hands-on experience. All students, regardless of specialization, must complete 9 credit hours of the same core requirements, which include either a research seminar in special education or a thesis option. Following the completion of all required coursework, students must pass their comprehensive exams in order to earn their degrees. Prospective students must already possess Bachelor of Science degrees from accredited institutions, then submit, along with their graduate school applications, the following items: the separate Professional Education Certification application (for those seeking teacher certification in special education); official transcripts showing GPAs of at least 3.0 in their last 60 hours of undergraduate coursework; a letter of intent, which must show the desired emphasis area; and 3 recommendation letters, including 1 from a present employer and 1 from someone who can speak to the student's academic record. All applicants will undergo background checks. Minnesota State University Mankato's Master of Science degree in Early Childhood Special Education is offered completely online. Typically, students can complete the 34-credit program in 3 years; students who already have Minnesota licenses to teach special education may be able to complete it in 1 year (all courses must be finished within 6 years). The program enables students to concurrently earn their M.S. degrees and teacher licenses, as well as to add special education licenses to their existing teacher licenses. Coursework covers theories and practice for special education as well as early childhood special education. Those without teaching licenses need to take courses in standards of effective practice. To complete the master's program, students complete educational or action research and a capstone course. MNSU's licensure options meet the requirements for the Minnesota Academic and Behavioral Strategist (ABS) license, a new special education license developed in Minnesota in 2013. To apply to the program, prospective students should submit, along with their graduate studies applications, their official college transcripts showing GPAs of at least 3.2 and proof of their bachelor's degrees from accredited institutions. Each college at MNSU has a student relations coordinator who assists students with academic advisement throughout their programs, and the school's online resources include course-planning worksheets and schedule builders. Students also gain access to the school's Career Development Center, which can assist with finding jobs, preparing resumes and offering interview advice. Operating as a private Christian institution in Kentucky, Campbellsville University offers associate, bachelor's and master's programs to approximately 4,000 learners annually â€“ including those who study via distance education. The master of arts in special education â€“ teacher leader program helps existing classroom teachers gain the advanced skills needed to create conducive learning environments for special education students at the P-12 level. In addition to the 30 required credits, distance learners participate in a semester-long research practicum at a school. Degree seekers observe a group of students, research and develop mediation methods and deliver intervention strategies before writing a paper about the process. Students complete 15 credits in personal core courses such as supervision of instruction, effective strategies for improved student behavior and research methods. They also take 15 credits in professional proficiency courses such as advanced assessment and instructional strategies for diverse learners, strategies for improving classroom behavior and designing/assessing effective instruction in mathematics. To receive consideration, applicants must provide GRE or Praxis CORE/CASE studies and a copy of their valid teaching certificate. They'll also need 3 letters of reference. All online learners pay $399 per credit. The department offers several scholarships specifically to those pursuing master's in special education degrees. Knowing that many learners work towards advanced degrees while still teaching, courses are taught asynchronously and students receive support from professors and administrators while enrolled. Learners can select from several start dates throughout the year to fit schedules. Because all courses are taught in shorter, accelerated 8-week sessions, most students finish all requirements within 2 years. A special education online master’s degree program teaches students how to work with children who have physical handicaps, emotional issues or learning disabilities. Students learn how to assess children for special education services, create an individual education plan for each child who needs one and work with the children and their parents on helping the children to achieve their unique goals. What common courses are offered in a master’s in Special Education program? Check out these five sample courses that you might encounter in an online master’s degree program in special education. This course provides students with a glimpse at advanced strategies for teaching youth with disabilities. Students also go over how to appropriately plan curricula for this population of students. This course offers students an opportunity to look at children’s social, psychological, emotional and behavioral needs and the ways in which these needs impact the children’s ability to do traditional coursework. Students learn how to encourage appropriate behaviors and reduce inappropriate actions in children. In this course, students examine the role that educational research plays in informing educators’ practices, as well as educational research’s limitations. Students are given the opportunity to select topics of interest and to conduct related literature reviews to produce final papers that demonstrate their understanding of the research studies they have discovered. The aim of this course is to teach students how leadership in special education has changed over time. Students also have the opportunity to explore special education federal law as well as ethical practices among special education leaders. In this course, students learn the contemporary and historical legislation, service delivery, policies and methods for transitional and educational programming for children with disabilities. The goal of the course is to help students to plan effective transitional life experiences for young people with disabilities. In an online master’s degree in special education, students are typically required to complete a master’s thesis or a capstone project. Some programs also require students to pass several cumulative examinations or a single comprehensive examination at the end of the program. Certain programs also require students to gain hands-on field experience through practicum experiences, which can take the form of student teaching hours or internships. All of this allows students to demonstrate the skills they have attained over the course of the master’s degree program. What specializations are available in a master’s in special education program? Online master’s degree programs in special education oftentimes offer students the opportunity to choose specializations in this broad career field. For instance, they may choose to specialize in applied behavior analysis, autism spectrum disorder and special education technology. Still other specializations include severe disabilities, mild to moderate disabilities, early childhood education, secondary education and elementary education. Take a look at these common online special education master’s degree specializations below. This specialization offers students an in-depth peek at behavior analysis principles and concepts. This information will help students to better understand the behavior and academic problems of students with special needs and thus more effectively develop and implement behavioral assessments as well as intervention procedures. With this specialization, students examine the behavioral characteristics and psychological models of autism spectrum disorders. This specialization offers the perfect opportunity for students to learn how autism influences an autistic student’s daily functioning in the home, community and school settings. Students who choose this specialization explore the delivery of content and the process of incorporating assistive and adaptable technologies into their learning plans. A graduate with this specialization is prepared to implement the latest technologies and tools into the special needs classroom. An online master’s degree in special education program will give you the necessary skills for excelling in a wide range of positions in this dynamic field. Take a look at a few of them below. These professionals help children who have physical, mental, learning, emotional or cognitive disabilities to reach their potential academically. These individuals strive to help these children to succeed in traditional academic subjects as well as master basic skills. Special education teachers may also be given the responsibility of overseeing other instructors or serving as the chairs of their departments. These individuals aim to make sure that curricula and the methods used to deliver instruction reflect the needs of students with disabilities. These professionals also work in tandem with other administrators and teachers to make sure that their well-thought-out action plans are executed daily, and they monitor for necessary changes. Some school districts have learning disabilities teacher consultants, known as LDT-Cs. Individuals in this career complete educational testing for students with disabilities or learning differences and create Individualized Education Programs (IEPs) for students. This job also requires direct work with teachers as an advocate for students with special needs to ensure their educational requirements are met. Similar to a learning disabilities teacher consultant, a special education advocate works closely with parents of children with special needs to ensure their legal, physical and educational needs are met at a school campus. An advocate helps parents navigate challenging legal rules and red tape surrounding the school system. An educational consultant no longer teaches directly in a classroom, but rather advises school districts and school staff on the best implementation methods and training programs for students with special needs. An educational consultant will work with school staff to teach them about the latest research and teaching methods that work for students with varying special needs. In addition to completing an online master’s degree program in special education, students may benefit from joining professional organizations for the purpose of networking with other professionals in the field. Here are a few that they may wish to consider. This membership association is the only one focused just on special education teachers. Through this association, special education teachers can take advantage of professional development and continuing education opportunities as well as career support, national conferences, events, publications and handouts. This organization offers convenient resources to its members, such as a section dedicated specifically to educators. Special education teachers can use this association to find research, information and publications on various learning disabilities. Through this council, special education teachers can gain access to professional development–related opportunities. The council also features local chapters that have regular events, along with research access, publications and national conferences for its members. Depending on the academic level and experience, those working in special education may fall within the range of salaries listed in the chart below. Students pursuing a career in special education should keep in mind that they may need additional licensure, certification and experience in addition to a master’s degree in special education to be eligible for certain careers. The Bureau of Labor Statistics states that the special education field—and the education field in general—will be in high demand over the next 10 years. When it comes to special education in particular, federal law mandates that all students who have disabilities receive free education. In addition, all states are required to maintain the same financial support level for their special education services each year. Funding increases may drive employment growth even more than what’s listed in the chart above during the next decade. Note that there is a difference in salary depending on your degree. The median annual salary for a graduate degree in special education is $61,000, whereas the median salary for a bachelor’s degree in this area is $45,000. Therefore, those who decide to earn an online master’s degree in special education may earn nearly $16,000 more per year. Students who want to increase their job opportunities in the special education teaching field should choose an online master’s degree in special education that is regionally accredited—not just nationally accredited. This will help to ensure that you have no problems with securing financial aid, transferring to another institution if needed, claiming a job and receiving licensure. In addition, look for a program that is accredited by the Council for the Accreditation of Educator Preparation. This is the gold standard for the accreditation of online master’s degrees in special education, as CAEP has garnered high levels of respect from licensing boards, schools and employers. Students can also look for a program that is accredited by the National Commission for the Accreditation of Special Education Services. In many situations, those studying special education at the graduate level may need a little help to cover the cost of their schooling. Financial aid may be available in the form of loans from the federal government for students who fill out the FAFSA. However, additional scholarship and funding opportunities may be available to those pursuing master’s degrees in special education online. Some schools may help cover the cost of obtaining a master’s degree in education. Ask your school administration if they help cover the cost of earning a master’s degree in special education. Many schools and foundations offer special scholarships for graduate students studying for a special education degree. The Arkansas Association of Special Education Administrators Memorial Scholarships offers scholarships are for $2,000 each. Any student completing a master’s degree in special education online can qualify for one of the five scholarships as long as he or she attends an accredited institution in Arkansas full-time. The Florence Harvey Memorial Scholarship offers $1,000 scholarship is available each year through the American Foundation for the Blind. Graduate students who are completing their studies in the field of special education are eligible to apply as long as they attended accredited colleges in the United States and have a minimum 3.0 grade point average (GPA). Kansas Teacher Service Scholarships are Kansas Board of Regents annual scholarships, valued at $5,500 or less every year, available to graduate students who are pursuing degrees in difficult-to-fill disciplines, such as special education. To qualify for one of these scholarships, a student must live in Kansas, attend an accredited institution in the state and have a 3.9 minimum GPA.